The Abit AB9 QuadGT was a very popular board if word through the tubes is to be believed. 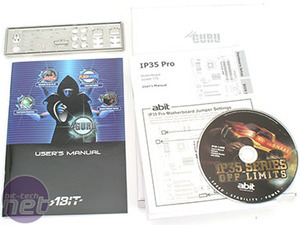 Stemming on from this P965 success, Abit has made the IP35 Pro with many elements of the QuadGT in mind. Gone are the digital PWMs though, and in place are the traditional analogue ones. This may seem like a step backwards, but Abit is actually listening to users who complained they ran too hot and caused CPU voltage drops (Vdroop). 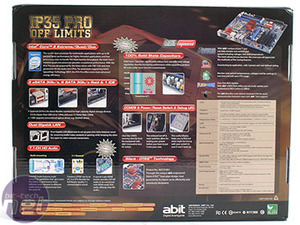 Already there are reports of some insane overclocking on these boards, even with very early BIOSes, so we just had to take a look to see what all the fuss was about. The IP35 Pro is missing a few PCI brackets considering the board supports an extra eight ports through pin-outs on board. An extra four port bracket would go a long way to adding more necessary USB connectivity. Firewire on the other hand is well covered with both 4-pin and 6-pin varieties being catered for from both sets of motherboard pin-outs. 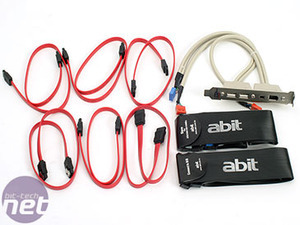 There is a red SATA cable for every SATA socket, and you also get separate uGuru and motherboard user manuals for the specific hardware/software applications of the package. The extra pin out sticker is more useful for PC builders who will stick it to the inside of the case door panel so it’s there when end users open the case. It’s not really for most of us, but it’s good to keep handy as a quick reference guide. No floppy disks are provided, mostly due to the fact that since Vista they are no longer required, but if you still need them for installing RAID on XP you can make them from the CD. 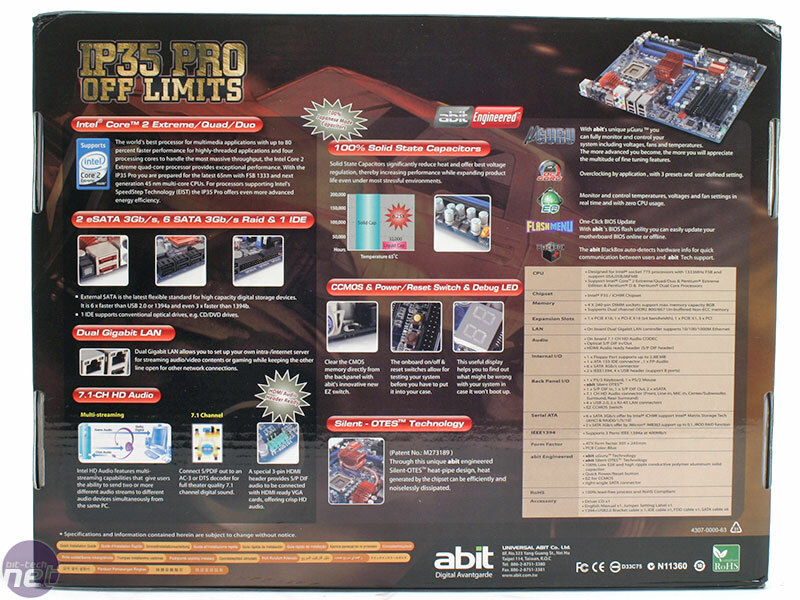 In all, there could be a few more bits thrown in especially since this is the more expensive “Pro” board, but it’s not all bad and Abit has most of its bases covered. 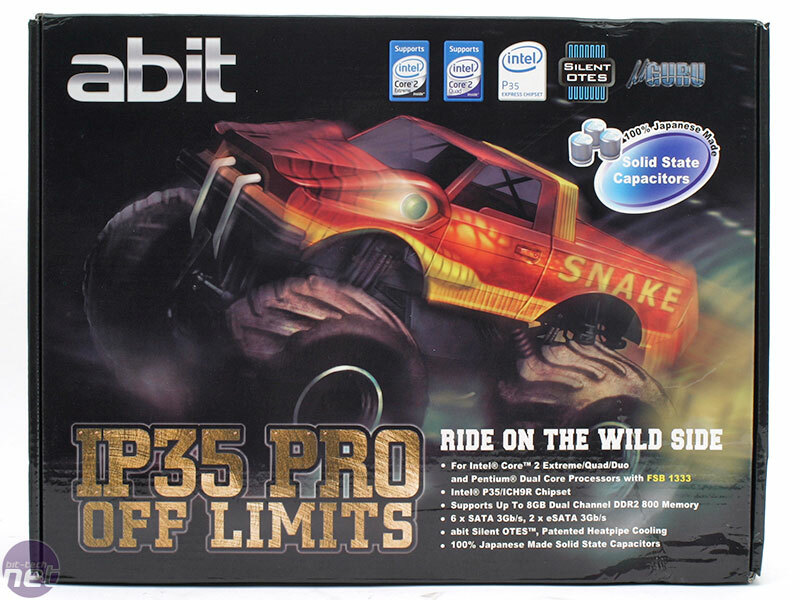 An inexpensive, well featured P35 board with Asus' energy efficient EPU and a full eight phase power regulation? The Asus P5K Pro seems to have it right - we find out if it's as good as the spec sheet implies. MSI's P35 Diamond features the same CircuPipe cooling system as the P35 Platinum, but comes with a few added features like a PCI-Express X-Fi, a SkyTel Skype card and DDR3 memory. Do these ingredients create a better board than the Platinum? Foxconn MARS has the Quantum Force! Straight out of an 80s cartoon, Foxconn launches the Quantum Force series, with its first mobo the MARS. Expect action figures and plastic lunch boxes featuring the logo in stores soon.